William Earl Johns was born in February 1893 at Bengeo in Hertfordshire, the son of a tailor. After short careers as apprentice to a county surveyor and as a sanitary inspector, Johns joined the Territorial Army as a Private in the King's Own Royal Regiment. He married Maude Hunt in October 1914. During the First World War, he fought at Gallipoli against the Turks and the Germans. As a machine gunner Johns was sent to Salonika in Greece. He took part in the spring offensive in April 1917, but Johns contracted malaria and whilst in hospital he put in for a transfer to the Royal Flying Corps, which was merged with the Royal Naval Air Service to form the Royal Air Force in April 1918. When his transfer came through he learnt to fly in "an old Rumpity", a Maurice Farman Shorthorn. His early experiences were to go into the book Biggles Learns to Fly. He had an aptitude for flying but had a number of spectacular crashes, stalling and crashing on his first solo flight, and once wrote off three planes in three days. This was not, however, unusual in those days. Whilst stationed at Marske-on-Sea, Yorkshire, the CO was a Major Champion, who was nicknamed Gimlet, a nickname Johns was to later borrow for one of his characters. A De Havilland DH4, the "flaming coffin". Johns was shot down over Germany in an aircraft of this type. Image courtesy of AgustaWestland. a good target for enemy aircraft. It was on Monday 16th September 1918 that Johns failed to return from a mission. He had spent the night in Nancy and got lost on the return journey, stopping at a magnificent French house at 3 a.m. to ask for directions. Here he had met a beautiful French girl and spent some time with her - she was to become the inspiration for the love of Biggles' life, Marie Janis in The Camels are coming. Johns' aircraft was hit by German anti-aircraft fire over Mannheim and its fuel tank holed. Forced out of formation, they were attacked by Fokker DVII fighters, the outstanding fighter of WW I. Johns made a forced landing and was captured. Accused of indiscriminate bombing of civilian targets, Johns was sentenced to be executed, but this was never carried out and he was sent to a Strasbourg gaol. After 2 escape attempts, one successful, he was recaptured whilst stealing apples. After the war, he was commissioned as a Lieutenant in the Inspectorate of Recruiting and recruited 'John Hume Ross' (T E Lawrence - of Arabia) into the RAF. Johns initially rejected Lawrence because of his assumed name, but was forced to take him by higher authority. Johns later exploded the myth that Lawrence's identity was a secret: from the first day one officer warned another that Aircraftman Second Class Ross dined with cabinet ministers. In 1922 Johns wrote his first novel, Mossyface, under the pseudonym William Earle (Johns adding the "e"). His marriage had now deteriorated and Johns fell in love with Doris May Leigh - they were inseparable until the day he died, although they never married. In 1927 he began selling aviation illustrations and writing aviation articles. Johns edited two books in 1931, The Modern Boy's Book of Aircraft and Wings: a Book of Flying Adventures. He also illustrated The Pictorial Flying Course, and Fighting Planes and Aces. In March 1932, John Hamilton Ltd, his publisher, launched Popular Flying and invited Johns to edit it. Johns created a fictional airman for the first issue - James Bigglesworth ('Biggles' ), credited as being written by 'William Earle'. In August 1932, John Hamilton published a collection of Biggles stories - the first Biggles book - as The Camels are Coming. It was around this time that Johns assumed the title Captain, although he only achieved the rank of Flying Officer, as he thought it might appeal more to children. Popular Flying lived up to its title and in 1934 its circulation was 24,500 a month. In 1935, it was sold to George Newnes Ltd. Newnes launched a sister paper to 'Popular Flying' - a weekly magazine called 'Flying' - which Johns edited. By February 1938, Johns was also writing a regular weekly column for 'The Modern Boy'. He was now writing books at an astonishing rate, some 40 between 1931 and 1939! Johns' opposition to the Government's policy of appeasement upset prominent politicians and he was removed as editor of Newnes' flying magazines. His last editorial for the weekly 'Flying' magazine was on 21st January 1939. During the Second World War, Johns' books encouraged hundreds of young men to train as pilots. Recognising this, the Air Ministry asked Johns to create a female counterpart to aid recruitment to the Women's Auxiliary Air Force, and thus Worrals appeared in 1941. The War Office needed their own hero so, in 1943, commando officer Gimlet appeared. Publishing of the books was transferred to Oxford University Press, who failed to recognise their potential, and then to Hodder and Stoughton. In 1944 Doris and Bill Johns moved to Grantown-on-Spey, Morayshire. For the post-war Biggles stories, Biggles joined the "Air Police". Johns sold serial rights to newspapers and magazines as well as one-off stories to the vast number of children's annuals being published. Compilations of these stories were regularly published in book form. 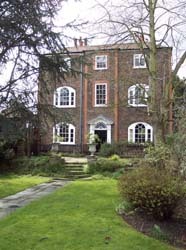 Johns moved to Park House, Hampton Court, in 1953, where he wrote the first of a series of science fiction stories. In 1964, the UNESCO Statistical Yearbook placed Biggles books 29th on a list of the most translated books in the world and Biggles was the most popular juvenile hero in the world. Biggles stories were serialised on the radio and also appeared in 1960 in a television series (although Johns' actual stories were not used). On the 21st June 1968, whilst writing Biggles Does Some Homework, Johns stopped to make a cup of tea. He went upstairs to Doris and sat in his armchair, suffered a fatal heart attack and died immediately. He was 75 years old. After Enid Blyton, Johns was the most prolific children's writer of his time. He wrote 169 books in total (104 were Biggles books) and many magazine articles. Dictionary of National Biography, 1961-1970, Oxford University Press. By Jove, Biggles! : The life of Captain W. E. Johns, Peter Berresford Ellis and Piers Williams, W. H. Allen, 1981.